emmatree: If I don't think it's art, is this okay? Photoshopped up. I did this, I did that, I made them look painterly. Back again in my head to thinking about art. Or maybe thinking about photography, thinking about what makes a photograph a photograph, what makes it art. Because here's the deal. Actually deals - plural. I have a couple of thinkings about this. First, I am a photo retoucher. I regularly play with photos, which makes it difficult for me not to. I know people who are photo "purists", who say it cannot be art if the image has been manipulated. And really, that's okay with me, because I don't think this is art. I think it's a photograph of flowers. Nothing more. But I also don't necessarily think that an image is art just because it hasn't been messed with, and those people I mentioned before tend to think it is. In addition, some of these people, back in pre-digital days, saw nothing wrong at all with all those darkroom tricks/tools, such as burning & dodging or re-cropping, and they still called the finished photographs art, and I'm not sure I see much of a difference. Second - collages. Painting on photographs. People do it all the time with wonderful results - results that reflect a particular person's vision. And as I have mentioned before, I am all about one's vision. And that is art. So if I allow Photoshop to do part of the work for me, is that not kind of the same thing? After all, I am somewhat familiar with Photoshop, it's not just a button I push, but even if it were, would my knowing which button to push, which keystroke, which program, which action to choose make it less my vision? Or does the finished piece need to, unlike photographs, show the touch of a human hand? I think it might, but I am just thinking out loud, just mulling it over. All this thinking on my part is Jaime's fault. Jaime, whose flower photographs are breathtaking. She asked for a picture of paperwhites. It sounds so simple, but here's the deal about that. 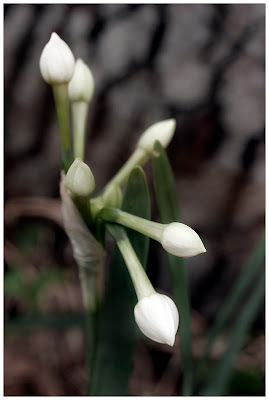 All the pictures I took looked like paperwhites, which is not quite really what I see in my head. My vision of paperwhites is all tangled up with how they make me feel and how they make me feel is happy, yes, but it is really about their being a harbinger of warmer weather, of springtime, of more flowers to follow, of their whiteness against the gray days of winter. So - this photograph. This movement into a new season. Apologists on both sides of this issue... I don't understand it, really. All images are manipulative because they are the direct consequence of where we decide to point our lens. The minute we click the button, we've decided what we want people to see. The only way to not manipulate an image is to not take it in the first place. One way is not more honest or better than another. It is a matter of choice and control over how people see things the way you want them to. Photography is an art - digital or film - shaped in the darkroom or edited on a computer. Photographs record not just what the eye sees - but how the soul feels about what the eyes are seeing. And your photographs make my soul sing. Yes! It is OK! And you've made it yours by doing your manipulations. Whether or not those manipulations occurred in the darkroom or digitally, they are still both post production work. Not unlike how one who paints would sit there and do final tweaking to THEIR image before calling it done. But, I know those people you speak of! The same ones who don't understand why anyone would want to take a digital image through a viewfinder of a twin lens reflex camera! But, it's all OK. Collectively, we are like the eye of a fly. Compound vision. It is better than okay. I have been observing this discussion in various forums for some time now and I'm glad to be having this conversation. I used to be on the side of the purists. But, as my own artistic vision grew and changed, so did my opinion. Is it or isn't it okay to mess with, create with, manipulate, photos? I think the answer has to be yes, it's okay. I think the art is in how the image makes someone feel. Does it matter how that was accomplished? Anyone can take a picture, any one can paint a picture, but to move people, or stir up a reaction in someone's soul, that to me is art, and that is generally accomplished through some sort of manipulation of what we see. Art is about interpretation, I think. So if ones interpretation includes altering the original image...... so be it. Is this ok, she asks.....Debi, it is wonderful. Such sweet little buds they are, and I so know what you mean... sometimes it's more about how something makes you feel, or what it conjures up in your imagination that is most important. I really don't know what the big fuss is about..whether something is *art* or not. Anything created by anyone, no matter what, who or how or why..is art in my humble opinion. I hate that people have to make up rules as to what art is or isn't. Who is the authority on this???? Why is there an authority on this? We are all creative beings and we all have something to express, and how we choose to do that is as individual to us as our own fingerprints. Thank you for showing me how lovely paperwhites are.